Building customer relationships plays a key role in maintaining and increasing profitability. 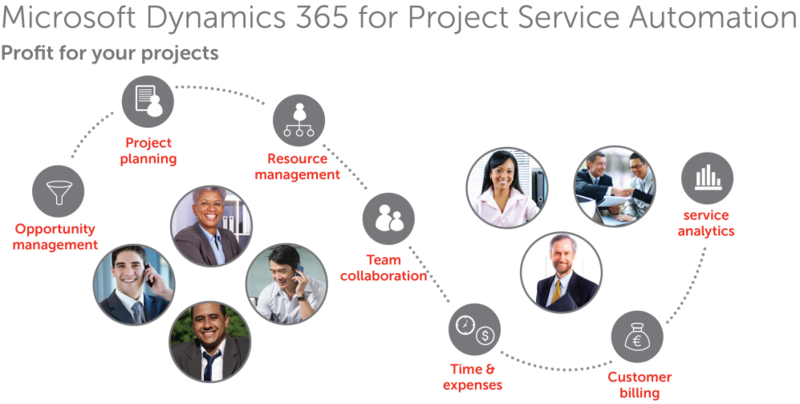 Dynamics 365 for Project Service Automation makes is easier to deliver your projects on time and within budget. Stay ahead of the curve while increasing productivity. Build trusted customer relationships using customer-responsive engagement models to deliver value-add success and consistency. Balance resource utilization and increase productivity across all projects while fostering team coordination, collaboration and personal creativity. Prioritize innovations in service offerings based on actionable insights and industry trends. Provide integrated sales dashboard with project-based opportunities to help identify profitability. Collaborate real-time with customers on quote, project scope, status updates and resource requirements through customer portals. Easily allow your sales manager to visualize costs, effort and sales value with project managers to estimate the work using standard templates. Project scheduling and management capabilities of Microsoft Project allow for a collaborative sales planning process. Provide powerful, mobile-ready Office 365 tools for project teams, customers and partners to communicate and collaborate on deliverables and tasks. Simplify the tracking and submission of estimated and billed project time by integrating the tasks and deliverables within calendars. Track all project and non-project schedules from any device. Anticipate business opportunities and optimize solution offerings to improve performance through analytics, interactive dashboards and data visualization for 360-degree visibility.